Continuing the charge to ramp up its social gifting product well into the holiday season, Facebook on Tuesday announced the wide rollout of Gifts to Facebook users in the United States. Previously, the product was in a limited invite-only mode, slowly spreading across the site user by user. When one person sent a gift to another, the recipient would then be able to start sending gifts to others (much in the way Google rolled out invites to Gmail and Google+ in the early days). Currently, most of Facebook’s gifting options are food and lifestyle related, including cookies and cupcakes, stuffed animals and other relatively low-cost items. But Tuesday’s wide Gifts rollout also comes with another gifting option: Wine. And lots of it. Facebook has partnered with 16 different wine makers, letting folks send each other bottles of red and white over the network. Not so fast, eager teenagers. Facebook has put into place a number of age-verification safeguards to keep minors from sending booze to one another. Users under 21 can’t send or receive alcohol via Gifts. And even if the kids somehow get around those barriers, the delivery service will still card you at the door to make sure you’re as old as you say you are. 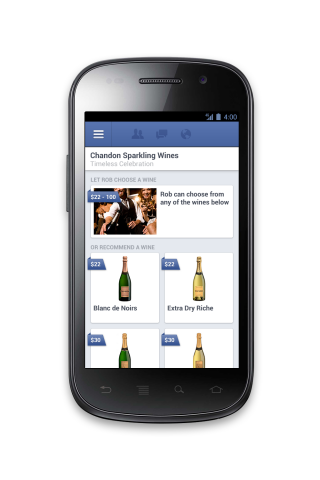 As the biggest shopping days of the year approach, Facebook has made it clear it wants to be a player in e-commerce. After rolling out physical Gifts in the fall, the company upped its game with the addition of some digital subscription options as gifts, including music and video services Rdio, Pandora and Hulu. And just last month, Facebook announced an agreement with Apple, letting users send one another iTunes credit to download music and movies. To be sure, Facebook is no Amazon or eBay at this point. The gift offerings are minor, and the company has a relatively small number of retail partners offering gifts on the service. But the idea that Facebook can eventually convince users that it’s more than a social network — that it’s a place to spend money with your stored credit card information — is far more valuable than any incidental revenue made up by customers’ Gift purchases. Perhaps come the time the company’s next quarterly earnings details are filed with the S.E.C., we’ll see just how many users Facebook wins over with Gifts.